Food plays such an integral role in my relationship, to the point where I may apply romance to things that don’t necessarily ooze love, passion, and all that good, mushy stuff. Every New Year’s Day we order takeout for dinner from our favorite Chinese restaurant and lovingly share noodles from styrofoam containers while we watch old movies in our PJ’s. Sundays for us are usually filled with errands and chores and I sometimes don’t have time to prepare a hearty dinner to prepare us for what’s in store that week; in a pinch, we turn to Taco Riendo for my favorite burritos. Joe’s preference, if asked what he wants for dinner, is always pizza, and the oven baked, Italian flatbread has been a main character in our love story. Remembering I left my keys at my parents’ house only when I had arrived at my apartment in Roxborough one summer night a few years ago is something we find funny now, but only because we were unexpectedly prepared with edible provisions. With our Rustica pizza pie in hand, we made light of our predicament and set up shop outdoors for an impromptu dinner under the stars. When Joe bought the house we now live in back in 2008, we celebrated with family, wine and pizza at Tacconelli’s. It was a great way to commemorate such a big moment and I remember feeling happy and proud, in a garlic-induced haze; not only had my boyfriend bought the house that would, unknowingly at the time, become our home, I had successfully eaten an outrageous number of slices. We’ve even been able to associate the worst pizza we’ve ever had with happy thoughts when we reminisce about late-night slices we ate in San Francisco. Though we know we can never truly replicate our favorite pizza at home, we do our best every now and then. I am never satisfied, though, with basic recipes and a combination of dough, sauce and cheese is just that. To really throw Joe for a loop and give him a slice of something none our favorite pizza parlors can offer, I made a gluten-free version that’s better for you and just flat-out clever. Preheat oven to 450 degrees and spray a cookie sheet with non-stick spray (I used my pizza stone.) Take 1 large head of fresh cauliflower, remove stems and leaves, and chop the florets into chunks. Using a cheese grater, grate into a large microwave safe bowl and microwave for 6 – 8 minutes. Add 1 cup of cooked cauliflower* to a large bowl and reserve the rest for another use (you can use to make additional crusts immediately, or store in your refrigerator for about a week.) To cauliflower, add cheese and egg and mix well. Transfer “dough” to cookie sheet or pizza stone and, with your hands, flatten into a round shape, about 9”. Brush top with olive oil and bake for 15 – 20 minutes. Remove from oven and add toppings to your liking, Place under a broiler at high heat until cheese is melted, about 3 minutes. Slice and serve. Substitution is something you learn as you cook more often, and finding another life for an unexpected ingredient is exciting. Like the mashed cauliflower I wrote about last year, this recipe masks the displeasure many associate with the vegetable by proving it can be flavorful when teamed with a great lineup of spices and other ingredients. Mozzarella cheese and egg act as a binder for the cooked cauliflower and it’s almost unbelievable to see them all come together to simulate pizza dough. You can add whatever toppings you prefer, just be sure they are cooked before placing the pie under a broiler. I chose spinach and tomatoes, with a little sauce, to roll with the “healthy” aspect of the recipe; of course, I added a handful of mozzarella cheese on top for good measure. 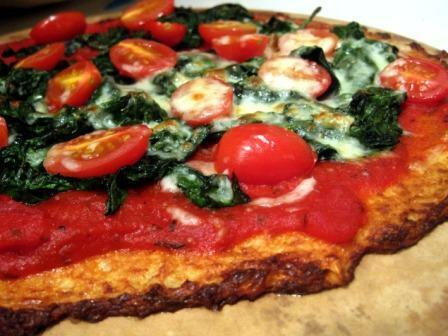 Though not crunchy like a thin crust pizza, the cauliflower crust holds up to the toppings and slices can be eaten by hand. Unlike most pizza’s, though, you can eat half of this pie without feeling guilty. With a real passion for pizza, Joe has quite a list of qualities the perfect slice must have. Texture and toppings are important, but I like to think the company in which it is eaten is first on the list. With that being said, I think he’s found a new favorite.